By LUDWIG VON KOOPA - If you do that, you will literally be no better than Crooked Hillary as a Senator. Originally I wanted to write a non-gaming article about the shooting, but President Donald John Trump changed KoopaTV's plans, as usual. President Donald John Trump is clearly not paying attention to his own speech while he's making it, so why should we? 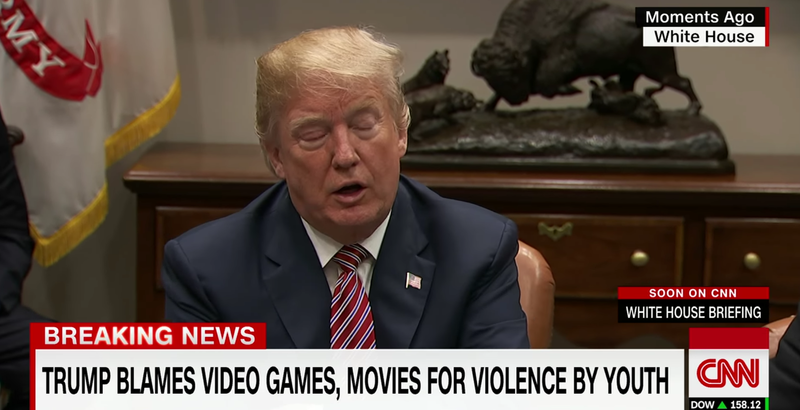 I'm not sure where the hell President Donald John Trump is hearing that about videogames, because I thought everyone kind of agreed to stop associating violent videogames with murders some years ago. I don't think he was thinking before he said that, so I'm not going to start acting like President Donald John Trump is creating policy positions and will push for any related legislation. There isn't any scientific evidence providing a causal link between videogame play and murderous behaviour. Trying to legislate access to violent videogames was something that Hillary Clinton attempted to do as a United States Senator, and was the number one reason we, as a gaming website, endorsed Candidate Donald Trump over Hillary. Hillary Clinton wrote a bill to ruin the videogame industry. For now, President Donald John Trump just said something stupid and outdated. We'll keep a very close eye on if something substantive comes out of his statements, or if he's just talking crap as usual. Ludwig might have to wait for the next school shooting or whatever to write about his thoughts specifically on mass-murderers with guns, unless games get pushed into the narrative in the future. Are you concerned about the future of the gaming industry based on President Donald John Trump's comments? ...Do you think he might have a point? Let KoopaTV know in the comments, or enjoy all (as of 2017) of KoopaTV's free Flash videogames that happened to show up below as related articles. It's possible that videogames screwed up the young minds in Trayvon Tyson's Punch-Out! !, but it's far more likely that it was the work of dark magic. Find out for yourself by playing it here! Idiot and church-shooter Dylann Roof is featured as an antagonist in KoopaTV's videogame, Capture the Confederate Flag. Get revenge on him here! Gun policy is not an issue addressed in KoopaTV's free Republican presidential primary simulator, The Wonderful 1237. ...Neither are any other policies. So you can enjoy it and think of it as realistic. If videogames cause violence, then what does playing Soviet Missile Run do for your mental health? Find out yourself by playing it on KoopaTV! While the President hasn't touched the games yet, he did have a meeting about it. I thought the "blame video games" mentality had shifted from the right to the left, so I was pretty surprised to hear about this. Well, I wouldn't consider President Donald John Trump a right-winger to begin with. ...Yeah, this is like taxing school lunches to fund foreign aid, or something. Republicans shouldn't be supporting that. People who have this mentality that violent media is the cause of mass shootings are ignorant. Millions of M rated games and R rated movie tickets are sold each year, yet, on average, overall shootings have decreased the past few years. The real blame should go to the FBI and school security gaurds who failed to stop Cruz beforehand and are partially responsible for this tragedy. ...yeah the security guard literally did nothing. If existing processes were followed, there'd be a different outcome to this. Instead, people want to be proactive without actually knowing what the impact of their decisions will be. ...Or they know the impact of their proactive actions and are using shootings as a pretense for social engineering. I'm waiting for the meeting to happen before writing further on it, because the ESA is claiming none of their members were contacted about a meeting. Not much article material if it's all in the President's head.